The March on Washington for Jobs and Freedom took place on 28 August 1963. An estimated 250,000 people attended the massive, peaceful rally, while many more watched the dramatic events live on television. In your community, groups are mobilizing for the March. You can get information on how to go to Washington by calling civil rights organizations, religious organizations, trade unions, fraternal organizations and youth groups. 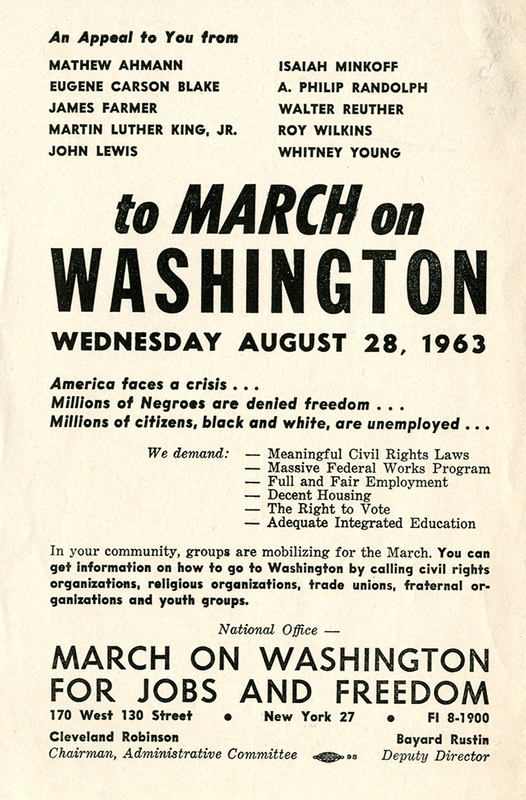 “March on Washington for Jobs and Freedom [publicity flyer],” Social Welfare History Image Portal, accessed April 26, 2019, https://images.socialwelfare.library.vcu.edu/items/show/248.